Got Beef? 100% All Beef Protein The World's First Beef Protein Isolate. Using new advanced extraction, clarification, hydrolysis and isolation technologies CARNIVOR’s Bioengineered Beef Protein Isolate delivers the muscle building power of beef with higher amino acid levels than all other protein sources used in supplements, including whey, soy, milk and egg. CARNIVOR Beef Protein Isolate is even 350% more concentrated in anabolic muscle building aminos than a prime sirloin steak! And it has no fat or cholesterol! The World's First Beef Protein Isolate is 350% More Concentrated Than Steak and More Concentrated Than Whey: Using new advanced extraction, clarification, hydrolysis and isolation technologies, CARNIVOR’s Bioengineered Beef Protein Isolate delivers the muscle building power of beef with higher amino acid levels than all other protein sources used in supplements including whey, soy, milk and egg. CARNIVOR Beef Protein Isolate is even 350% more concentrated in anabolic muscle building aminos than a prime sirloin steak! And it has no fat or cholesterol! 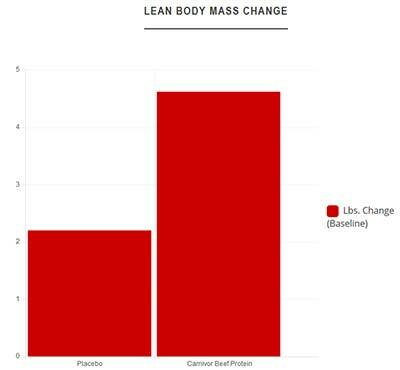 To further boost the anabolic muscle building action of CARNIVOR, additional Branched Chain Amino Acids are added to the purified Beef Protein Isolate. The enhanced BCAA levels promote a positive nitrogen balance, increase protein synthesis, decrease catabolism, improve workout performance and reduce muscle fatigue. BEEF-UP with CARNIVOR! 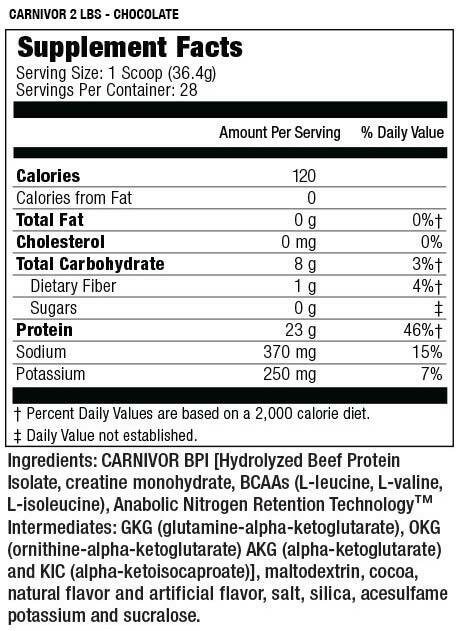 What's In Carnivor Beef Protein By MuscleMeds? How Do I Use Carnivor Beef Protein By MuscleMeds? Dosage: For a delicious shake, mix 1-2 scoops of Carnivor Beef Protein (yielding 23-46g of protein) with 6-12 oz of cold water. Drink 1-3 times daily or as needed to satisfy your protein requirements. Protein may foam after mixing. The Protein Meat everyone knows is the best because it contains more amino acids is why carnivor is better than whey, and still have a thing, it is hydrolyzed!! which causes the absorption is rapid! An excellent product with very good price! We have a large selection of in-stock MuscleMeds products including Beef Protein items and others for the lowest prices at SameDaySupplements.com® It's always easy to shop for Carnivor Beef Protein By MuscleMeds at SameDaySupplements.com® because you can browse by reviews, brand, prices or search for specific ingredients using our search tool. In-stock orders placed before 3pm EST ship out the same day to USA, Brazil, United Kingdom, Canada, Germany, Australia, Japan, India, France and worldwide at the cheapest prices online.